Thailand is known for many things: elephants, great food, amazing Similan scuba diving and watersports, brilliant weather, and outstanding natural beauty. One of the most stunning areas of Thailand is the Khao Sok National Park. The park is located in the southern Thai mainland between Khao Lak, Phuket, Krabi, and Kho Samui. With its stunning beauty, the Khao Sok National Park is definitely one destination that should be listed on your Thai holiday itinerary. 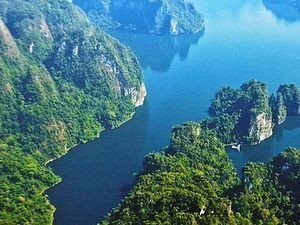 The park is also home to the Cheow Lan Lake, colloquially known as the Khao Sok Lake. This stunning 165 square kilometers Lake is also called the Rajjaprabha Dam Reservoir. This is one of the most stunning lakes to experience with its incredibly rich flora and fauna, as well as being a place of truly outstanding natural beauty. The lake is also home to many animal species, including monkeys and other small primates. How to get to Khao Sok? There are many ways to get to Khao Sok National Park once you are in Thailand – buses, minibuses, private taxi… One of the easiest ways to experience Khao Sok is from Khao Lak with one of our Khao Lak Explorer tours. Due to the proximity, it’s only a short trip by car from Khao Lak before you can experience the magnificence of Khao Sok National Park. If you want to go by yourself, the bus is very very slow and you will waist half a day to get there. Knowing the park close at 16:30 and the last bus back around 15:00 it s not worth it. A private taxi is a good option. 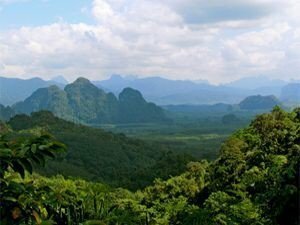 There are many activities and excursions you can enjoy on your visit to Khao Sok National Park. One of the most popular is elephant trekking in Khao Sok. Here, not only do you get to enjoy the outstanding beauty of the park, but you also get to encounter one of nature’s most amazing animals the Asiatic elephant. The experience of trekking through the jungle on the back of an elephant that nimbly dances its way through the canopy is one experience to behold. Despite their size once you are in close proximity to an elephant you realize how intelligent and gentle these amazing beasts really are. For those who do not want to ride an elephant, you can experience the splendor of the park by trekking around it on foot. This is a truly stunning experience as you get to admire the sheer beauty of the jungle from below the canopy, and get to take your time having a look around at the flora and the exciting jungle wildlife. Canoeing and kayaking treks can also be undertaken by those wishing to explore the park even further. You not only get to experience the rainforest from land, but also the beautiful Khao Sok Lake and other waterways. Gently paddling your way while soaking in the stunning views of the rainforest gives you and new perspective on the majestic beauty of the jungle. Furthermore, whether you take a jungle trip or a Khao Sok Lake trip, there are plenty of stunning caves and limestone formations to be explored. The Khao Sok Park caves are renowned for being the home of amazing formations. You cannot help but be amazed as you meander around beautiful stalagmites on the cave floor, or gaze up in amazement at the gravity-defying stalactites suspended from the cave ceilings. If you decide to spend the night in Khao Sok National Park, there are multiple options available to suits most budgets; from basic bungalows with shared amenities to deluxe bungalows with private toilets and showers. At Khao Sok Lake there is different ranges of floating houses, from very very basics to luxury. How long does it take to get to the park from Khao Lak? Traveling by private minibus or private taxi, it take no more than about an hour to get to the park and 2h to the lake; if you take the bus 3h to the park and 4h+ to the lake…. Do I have to book an overnight stayor can I do a day trip? With Khoa Lak Explorer, you can either book a guided day trip or a guided overnight trip to the lake or the jungle with different accommodation options to suit your budget. Find all the tours at Khao Lak Tours. Do I get to visit the jungle and lake in one trip? 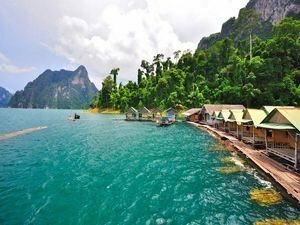 No, due to the size of the National Park, exploring the Khao Sok Jungle is one trip and exploring the Khao Sok Lake is another trip – both can be either day or overnight trips. We can customize you a private trip if you wish to do something different that our standard tour. Are there discounts for booking multiple trips? Yes, with Khao Lak Explorer, there are discounts available for multiple bookings as well as discounts for those who are scuba diving with Khao Lak Explorer.